Hydroponics is simply the growing of plants without soil. Instead, plants are grown in an inert medium (or none at all) and an oxygenated, balanced nutrient solution is delivered to a their root systems. That's it! Why does Cannabis Hydroponics produce such fantastic results? #1 We give it a perfect diet. In nature this is next to impossible, so when this actually happens, plants GROW & GROW & GROW. #2 When we GIVE the plant it's food it doesn't have to go out looking for it. Plants actually expend energy looking for food by growing huge root systems. If the plant doesn't have to waste energy looking for food, it puts all of it's effort into the parts above ground. The results are rapid, large healthy growth and massive fruit and flower production. #3 By necessity, hydroponic systems are automated. This removes the negative human influence from plant cultivation. Specifically, forgetting to water, or watering too much. How do I grow my cannabis plants hydroponically? Fortunately, many methods of hydroponic growing have been invented throughout the years - from painfully simple to slightly complex. All you need to do is select the system that meets your needs and build it. As luck would have it, all of the systems that have been invented use very basic items assembled into very basic mechanisms. There is practically no method you cannot construct at home with no more than hand tools and commonly available parts. All plants, weather grown hydroponically or in soil, need 16 basic elements to grow. Most of us are familiar with the top three that are consumed by plants. These elements are called the Macro-Elements and they are Nitrogen Phosphorous and Potassium, they are abbreviated N P K. You probably have seen these letters on bags of common fertilizer. The other 13 elements are grouped together as the Micro-Elements. Most people are not familiar with these elements because we have always counted on them being present in the soil, which works for the most part. Pre-Formulated Nutrients: This is really the best option for the hobby to small farm hydroponic grower. You can be assured that all of the necessary nutrients are present and available to the plants. All you have to do is mix a predetermined amount of concentrate with water and add it to your system. If you want to be successful as a first time hydroponic grower, use a ready made nutrient specifically for hydroponics. Pre-Formulated Nutrients come in the forms of 1-part powders, 2-part powders, 1-part liquids, 2-part liquids, & 3-part liquids. I have found that nutrients are pretty much nutrients, with the exception of the General Hydroponics 3-part flora series. This one nutrient system really stands out above the rest, it gives the best results by far. You can customize the mix for specific crops and different phases of the crop (i.e. one mix for vegetative growth and another for flowering/fruiting phases of growth). Formulating your own: Once you have some experience with hydroponics and you are producing large crops of a specific plant, you may want to look into formulating your own nutrients. Since all plants do not consume the same amounts of nutrients (individual elements) you can possibly save yourself some money by making very specific formulas for your crop. This involves a good amount of chemistry knowledge, some lab equipment and each of the 16 individual elemental nutrients. Many crop specific formulas exist from others' research, all you have to do is find the right recipe and mix it up. Over time you will probably adjust this formula to match your growing conditions and crop more closely. Mixing your own is best left to the more experienced who are producing large amounts of one crop (i.e. 1/4 acre on up). Miracle Grow: Many people insist on trying to use miracle grow plant food as a hydroponic nutrient. It is true that this is great stuff for soil, I personally use it on my flowers, grown in the dirt garden, and man do they freak out. Let me stress though, this stuff is not a complete nutrient for hydroponics. It does contain some micro elements, but not all. Your plants will start out fine using this, but eventually they will suffer from deficiencies. In the long run it is not worth the cost savings over a real hydroponic nutrient. The analogy would be something like buying a brand new corvette and then having the cheapest tires put on it and filling up with the cheapest gasoline. You will not even come close to getting the performance that is possible. There are quite a few hydroponic additives on the market. They mainly consist of combinations of kelp extracts, bone meal and blood meal. They are commonly sold as "Organic" boosters just to hook the "green" crowd. They are supposed to supply enzymes, hormones, vitamins, amino acids, sugars, and plant acids that can't be supplied by hydroponic nutrients. I believe that there are some merits to using these additives, but many of the claims made by these products are UNFOUNDED and UNTRUE. I have tried the "Earth Juice Catalyst" and I THINK that I saw a performance increase, but nothing major. In the future I will perform an experiment with a control group of plants to see how this stuff really performs. One additive that falls in it's own class is the "DynaGRO PRO-TEEKT". It is a potassium and silicon supplement that is supposed to help increase resistance to pathogens, increase resistance to heat stress and build stem strength. I have yet to try this product. The bottom line on additives: There are no scientific studies showing any benefits so the jury is still out. Buyer beware!! pH is simply the measure of the acid content of a solution. The pH scale runs from 1 to 14, 1 being very acidic, 7 is neutral, and 14 is very basic. pH affects the ability of a plant's roots to absorb nutrients. The range in which nutrient absorption is best is from 5.8 to 6.5. Measuring pH: You can measure pH either chemically or electronically. Chemical test kits cost about $8 to $18, they are accurate but you have to replace them periodically because the chemicals are consumed. Electronic methods typically are packaged as a pen that you simply dip into the solution and the pH is read out on a digital LCD display. pH pens cost about $65 to $100, they are fairly accurate and must be calibrated periodically. The benefit is ease of use and they don't wear out - a wise investment. Adjusting pH: To lower pH add acid. The best acids to use are phosphoric, nitric, and sulfuric acid, these acids disassociate and free up phosphorous, nitrogen an sulfur respectively. Nitrogen, Phosphorous and Sulfur are all elements that plants need for growth. I have heard of people using Distilled Vinegar for pH adjustment, this seems a bit sketchy to me but I suppose it would word in a pinch. To raise pH add a base. The bases used in hydroponics are Potassium Hydroxide and Sodium Hydroxide. These disassociate and provide Potassium and Sodium, respectively. Another pH up "elixir" that I have heard of is baking soda - personally I think this is a bad idea. TIP! When adding acid or base to adjust your nutrient solution, add small amounts at a time and wait about 1/2 hour to take a measurement. The closer your pH is to 7, the less acid or base it takes to effect change. This change takes place exponentially, for example: it can take two milliliters of acid move the pH of 25 gallons of nutrient from 7 to 6. From 6 to 5 it can take 8 milliliters, from 5 to 4 it can take 500 milliliters. BE CAREFUL and make changes slowly. Making your own pH adjusting solutions: One quart of acid or base from General Hydroponics retails for about $7.00. This is the biggest rip off in the hydroponic business! It takes about $10.00 of concentrated acid or base to make 2000 gallons of pH adjusting solution. Subtract packaging and shipping and you'll see that they turn $10 into $4000. OUCH!!!!! With the relatively recent green movement the concept of "Organic" food production rings louder and louder every day. "Organic" guidelines generally prohibit the use of any refined chemicals in food production. The result is fertilizers derived from compost and animal waste. Naturally people want to try to apply these principles to hydroponics in the form of a teas made from compost and other natural ingredients. This seems logical but the result is counter productive when used in a hydroponics environment. To understand why, we must first understand what nutrients are and how they are absorbed by plants. Plants rely upon sixteen basic chemical elements for food - Nitrogen, Potassium, Phosphorus, Calcium, Hydrogen, and Oxygen are just a few. These elements must be in a form that can be absorbed by a plant. This form is a chemical salt - a very basic chemical compound containing one of the sixteen elements and a complementary element that forms a salt. These "elemental" salts are what is absorbed from the soil by a plant's root sysetm. To be perfectly clear here - it is salts and only salts that a plat absorbs, nothing else. So, the big question is - In the natural"organic" cycle of things how do these chemical salts get into the soil? Let's start with organic material (compost) and follow it to absorption by the plant. A bit of compost contains complex organic chemical chains that contain the elements for the chemical salts that eventually will be absorbed by a plant. At this point these complex chemicals cannot be used by a plant. When the compost gets mixed into the soil it starts to be acted upon by soil born bacteria. This bacteria is what breaks the organic material down into the chemical salts that can be used by plants. Mother Nature uses bacteria to refine organic material into inorganic chemical compounds for plant absorption. In a hydroponic system sufficient bacteria are not present for this critical conversion, instead we must provide these refined chemicals directly to the system. For those who insist that they can do it "organically" there are some "organic" nutrient mixes available for you to try. They typically produce limited results that I believe is entirely counterproductive to the hydroponic philosophy. I suggest that if you want to grow organically, do it in the dirt. Heavily supplement your soil with natural fertilizers and you will get excellent results. I do this in my own dirt garden and everything grows wonderfully. We all learned in grade school that plants "breathe" in Carbon Dioxide and exhale oxygen. However, the thing that wasn't talked about is how the root systems use oxygen!! In hydroponic practice one of the major directives is to supply an oxygenated nutrient to the plat root system. So, in whatever type ofhydroponic system that we use, we need to make sure that the nutrient is properly oxygenated. All right, all right, you don't need to know all of the dirty details to get going, you can learn that stuff later. Overview: In order to get your feet wet with hydroponics we are going to choose a simple, low maintenance hydroponic system and grow a hearty medium growing speed plant in order to keep nutrient usage to a minimum. Use a one-part nutrient (just mix with water) and unless you live in an area with EXTREMELY hard water don't worry about pH. The system: I highly recommend using the "Aquafarm" type bucket based system (see the free plans) for starters. They are extremely cheap and require practically no effort to operate. The Plants: To begin with grow a semi-hearty cannabis such as thyme, mint, or basil. These plants are basically weeds and don't care too much about having a critical nutrient or pH balance. Also, since they are a weed, they really go nuts when you give the hydroponic treatment. We also choose this type of plant because it is relatively slow growing and won't be using large volumes of nutrient solution. In the peak of the growing season, plants like tomatoes, squash and cucumbers can use many gallons of nutrient per day. Avoid these in the beginning otherwise you will be constantly worrying about maintaining nutrient levels - later on you'll see that with a bigger commitment, there are simple ways of maintaining the nutrients automatically. Nutrients: Initially, I recommend using a one-part nutrient such as the General Hydroponics "Flora-Magic". It is a one-part powder that you simply mix with water. Maintenance: The only thing you'll need to do is monitor the nutrient level in your hydroponic system topping the level off with water between scheduled nutrient changes. Initially, your young plants will not use much nutrient at all, so changing the nutrient once every two weeks is sufficient. Once the plants start consuming the nutrient then a once-a-week change is in order. Drain the old nutrient into your flower beds (it's still good stuff) and recharge the system with fresh. The first thing we need to do is establish a basic vocabulary about light & lighting. I'll describe the terms and try to put them in as plain of English as possible. Next, we need to establish reference points to work from. Finally we will examine different artificial lighting systems. Lumen: This is the basic unit of light. If you could grab a bunch of light in your arms, the term lumen would describe the amount of light that you have. Since this is the description of the TOTAL amount of light, it would go to follow that if you stuffed that light (the ball that you had in your arms) into a jar, the amount of lumens you have is still the same. Conversely, if you let the ball of light expand to fill the room the amount of lumens is also the same. Foot Candle: This is the basic unit of light intensity or how much light you shine on a given area. The foot candle is based on how many lumens of light you shine on a given area (measured in square feet). An example would be: If you shine one lumen of light on one square foot - you get one foot candle. If you shine 10 lumens on one square foot - you get 10 foot candles. Light intensity is what really counts for plant growth. This is the term that you need to understand, for we will be talking about it the most. Watt: The watt is a unit of energy that is commonly applied to electricity. We will be using this term in relation to artificial lighting. Lumens per Watt: This is relation to artificial lighting. Lumens per watt refers to how many lumens of light that a bulb generates per watt of electrical usage. The higher the ratio, the more efficient the lighting system will be. Outside Daylight: This is the biggy! Direct outside daylight in the summer time is somewhere in the neighborhood of 10,000 foot candles. This is equal to 10,000 lumens per square foot. If you already know a little bit about lighting, you will find this really amazing. If not, as our discussion continues this will eventually hit you as amazing. Open Shade: While standing under a large tall tree, you experience the amount of light referred to as open shade. The light intensity you experience here is somewhere in the neighborhood of 300 foot candles. Deep Shade: 50 to 100 foot candles. Average Lit Room: 5 to 10 foot candles. Full Moonlight: .02 foot candles. Now is this amazing or what? The human eye is mindboglingly sensitive, it can see from daylight all the way down to starlight (one of my hobbies is astronomy and I have found that after your eye dark adapts you can see quite well under the starlight). This is a ratio of 90 million to 1! Even more amazing is the fact that the eye can make the bulk of this adjustment in a fraction of a second. The rest happens in about 20 minutes. Having brought this to light, you can understand how it is easy to come to the conclusion that an unknowingly unsuitable light source would actually seem bright enough to grow plants under by looking at it. Now we will review the major lighting systems, their efficiency, and examine how they perform in a horticultural situation. If, per chance this discussion gets too technical or boring you can skip to the end of this segment and look at the overall comparison chart to get a general idea of how different lighting systems perform. Basis for Calculations:In all of the following examples we are going to assume that the efficiency of the lighting system is 75%. In other words, only 75% of the light created by the bulb is reflected onto our example garden. Furthermore, we are going to greatly simplify things by assuming that all of the light aimed at our target area actually hits the area - there is no "spillage" so to speak. In practice results will be much different - typically much lower than the stated figures. The idea of this presentation is to communicate the practicality of different lighting systems by placing them on common ground (which really doesn't exist) and comparing them to one another. Incandescent: Incandescent lighting is your common everyday household light bulb. Their efficiency is in the range of 4 lumens per watt. This means that a 100 watt bulb will generate 400 lumens - TOTAL. (Here's the big leap) Now, if we COULD reflect all of that 400 lumens onto 1 square foot we would get a light intensity of 400 foot candles. It is really not practical that we could design any reflector system that is 100% efficient, so for the purposes of our discussions we will assume 75% reflectance for all of our lighting systems. If we account for the loss in reflectance, we now get 300 foot candles from an incandescent bulb focused on one square foot. Lets step back here and do a comparison.... 300 F.C. Compared to 10,000? Wow! we aren't even close to daylight. If we used one 100 watt bulb over a 4 foot by 4 foot garden the light intensity would be 18.75 F.C., Which is totally useless. If we wanted to shoot for 500 F.C. for growing low light plants, we would need 26 - 100 watt bulbs. If we wanted to shoot for 1000 F.C. we would need 53 - 100 watt bulbs over our garden. Aside from the electrical nightmare, we have succeeded in creating an easy-bake-oven instead of an indoor garden. I hope that you see that incandescent light bulbs are truly impractical for horticultural purposes. Quartz Halogen: Halogens do a lot better at and efficiency of about 20 lumens per watt. Halogens are available in 1000 watt bulbs and since we are trying for as much light as possible, we'll use this for our example. A 1000 watt bulb producing 20 lumens per watt give us 20,000 lumens of total light energy. Our hypothetical light fixture can only reflect 75% of this, so we now have only 15,000 lumens to work with. Our sample garden, 4 foot by 4 foot, has 16 square feet. When we shine our 15,000 lumens onto 16 square feet of growing area we get a light intensity of 937 foot candles. No we're getting into a useable range but, there is one major drawback to halogens.....HEAT. 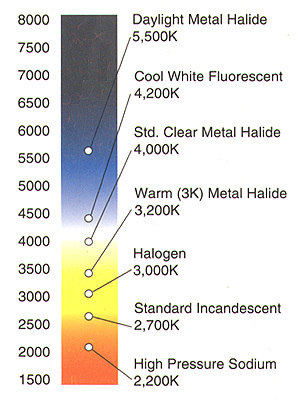 Halogens produce a disproportionate amount of heat in comparison to their light output. Let's look for something better. Fluorescent: Since we are trying to be educated gardeners, we will have sought out the extra high output tubes for our garden. These Fluorescent tube generate 2750 lumens per 40 watt tube. That's 68 lumens per watt - now we are getting somewhere. Let's use enough fixtures to cover our 4x4 garden. The fixtures are 4 feet long by six inches wide. This allows us to cram 8 fixtures over our garden - using a total of 640 watts. Each fixture hold 2 tubes, so we have a total of 16 tubes generating 2750 lumens each - that's a total of 44,000 lumens. Subtracting for the loss due to reflectance, we now have 33,000 lumens to cover our garden with. 33,000 divided by 16 square feet equals 2062 foot candles of light intensity, ASSUMING the lights are right on top of the plants. When you raise the lights to accommodate for the plants the light intensity drops rapidly. When you double the distance, you cut the light intensity by four times - OUCH. Using an array of 16 - 40 watt tubes you can expect to achieve about 500 foot candles at a distance of 12 inches. With this setup we can grow low to medium light plants without burning them. Metal Halide:This is what we have been looking for. Metal halide lights have an efficiency range of 80 - 120 lumens per watt. This let's us use a lower input wattage, generates more light and less heat than all of the previous systems. The following table shows the different wattage bulbs, their efficiency, total light output, and the light intensity over a 4 foot x 4 foot garden. Many people choke over the initial cost of a High Intensity Discharge fixture, but in the long run they are much cheaper. For the same amount of light output M.H. uses 2-20 times less power than other light sources. Sodium Vapor: The king of efficiency! Sodium vapor lights output from 90-150 lumens per watt. Sodium bulbs put out more light than metal halides but the spectrum is severely shifted towards the red end of the spectrum. The effects of the reddish light are supposed to produce more flowering and fruiting than more balanced lights. As you can see by the table, sodium vapor wins the light intensity contest hands down. The diagram above shows the full range of light and where each type of lighting system falls within that range. Artificial lights produce just a slice of the full range. This leads to much discussion and experimentation to determine which, or which combination of lighting is best for a particular crop. Lets establish a reference point to work from, examine several types of lighting and put this information to practical use. Reference point: For most of the daylight hours, the outside daylight peak is centered on 5500 degrees Kelvin (refer to the above chart). Metal Halide: These lights emit a light on the bluish side of the spectrum. They are considered a grow light and it is considered that they produce a more stalky vegetative type of growth in plants. 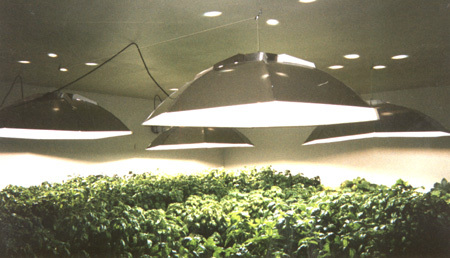 These lights are commonly used throughout all phases of plant growth and produce excellent results. Agro Sun Halide: Agro Sun is a hybrid halide bulb that generates extra red light for flower and fruit production. This is considered to be the best choice for artificial lighting of plants. Sodium Vapor: Sodium vapor lighting is way down in the red. There is some indication as well as a lot of marketing hype that the spectrum produced by these lights promote flowering. Personally, I'd like to see a scientific study to verify this. The bottom line on spectrum: Spectrum is secondary to the over all indensity. Remeber, in any artificial lighting situation, we are able to provide only a fraction of natural lighting. Therefore, it is more important to provide intensity than any other lighting factor. For example if you have to choose between a 70 watt sodium vapor and a 400 watt metal halide the only choice is the 400 watt system. The over all performace will be much greater, even if you favor a certain spectrum.